You’ve certainly heard the old adage about using the right tool for the job. Well how often do you really need a gigantic pickup truck? Most of the time it serves as a run about for the family, burning too much fuel and causing headaches when trying to park. You should check out the 2019 Honda Ridgeline RTL-T for sale in Fontana, CA. This intelligently sized truck will meet a majority of your hauling or towing needs, but, thanks to its modest size and efficient engine, it helps you truck smarter. Come visit us at Rock Honda and check out the 2019 Honda Ridgeline RTL-T for yourself. Our knowledgeable sales people will show you all of the Ridgeline’s innovative features, then we’ll get you behind the wheel to test drive a 2019 Honda Ridgeline RTL-T near San Bernardino, CA. We’re located in Fontana, CA and have wowed customers from the surrounding areas near San Bernardino and Rancho Cucamonga, CA. We always have a large 2019 Honda Ridgeline RTL-T inventory near San Bernardino, CA so you can drive one home today. The first thing you’ll notice about the 2019 Honda Ridgeline RTL-T in Fontana, CA is its size. With a footprint about the same size as a mid-sized crossover, maneuvering the Ridgeline is a breeze compared to a traditional, lumbering pickup truck. 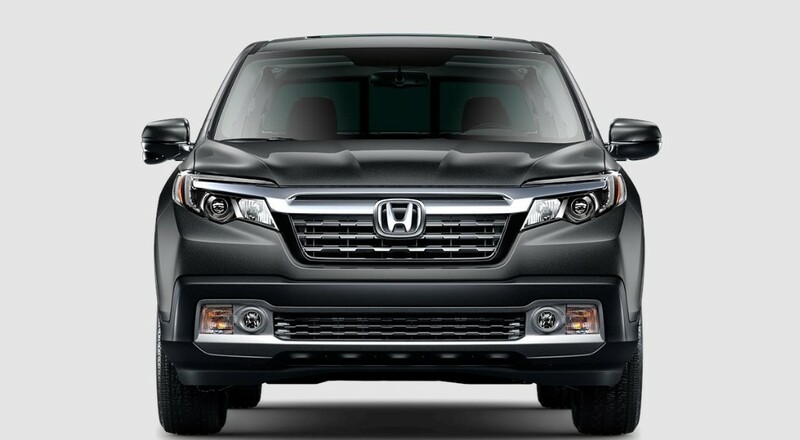 Next, you’ll notice the smooth and elegant lines of the Ridgeline that delight your eyes while also helping it slip through the air more efficiently. When you climb inside, you’ll find ample seating for five passengers, leather covering all the seats, plus a sunroof to let in fresh air and sunlight. To keep everyone comfortable in the Inland Empire, a tri-zone automatic climate control creates separate temperature zones for the driver, front passenger, and rear seats. The front passengers also enjoy heated seats. In the center stack, the Ridgeline RTL-T comes equipped with the Honda Satellite-Linked Navigation System™ which features Garmin® based navigation with 3D maps, 8-inch touchscreen display, and smartphone integration with Apple CarPlay™ and Android Auto™. Delivering the muscle is a 3.5-liter V6 engine that churns out 280 horsepower, 262 lb-ft of torque, and excellent fuel economy. Equip your Ridgeline RTL-T with Honda’s intelligent all-wheel-drive system and you’ll have the reassurance of better traction, plus you’ll be able to tow up to 5,000 pounds. Managing the engine’s power is a smooth-shifting six-speed automatic transmission. You’ll appreciate the innovative bed of the Ridgeline which offers a two-way opening tailgate, an In-Bed Trunk® proving concealed storage, and an available truck bed audio system to play tunes from the truck bed. Test drive here at Rock Honda to see why this truck is overhauling the truck industry! Our sales professionals are standing by to assist you with any questions.